Yesterday, discussion in my question's comment section was getting long so I transferred it to chat and had a long talk with another person. Now, if I want to talk to that user in chat what should I do? Is there any way to invite him again to that chat room? It is possible to invite a user that has a chat-profile to a chat. For details on how to do that see How do I contact other users? 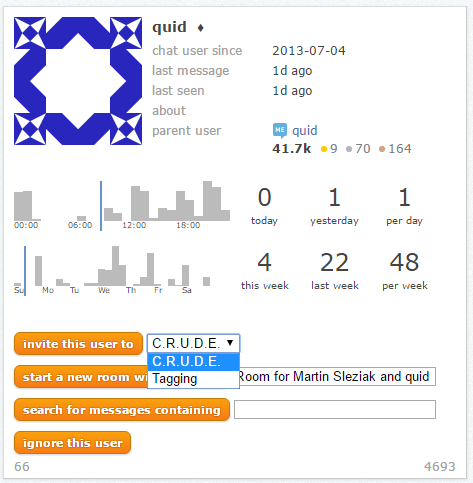 As the link in quid's answer explains, you can create a new room for you or another user. I will add that it is also possible to invite a user to already existing room. "Invite this user to" with a list of rooms you're currently in. (So do not forget that if you want to invite a user to an already existing you room, you have to be already in this room. Start a new room with this user. If have created a chatroom with the intention to continue discussion you started with some other user in comments - or if you want to use some existing room for this - the reasonable approach is simply to ping the user in comments and include a link to the chatroom. It is possible that some other users who read your discussion in comment might be interested in the same topic, including link to the chatroom provides those users with a link to the place where the discussion continued. How could I create a chat-room; and invite a specific user to be there [ofcourse if he, him-self wants]?